One of the most common questions I get is, "how'd you make those Yo Gabba Gabba dresses?" I can't help you with the Brobee dress, that's made from a cast & crew shirt (although you could certainly make a dress out of any cool YGG tee!) But I can help you with the Muno dress (or whatever character you want) -- and here's a little how-to. First you need your dress pattern. Any simple, a-line dress with a one-piece front will work. I used this cute dress pattern, Butterick 3772. Here's another Butterick dress/top pattern, that wraps and ties instead of fastening at the shoulder. The Farbenmix Anna dress would also be perfect, although a little harder to find. And here's a simple McCall's dress with no fasteners at all! Now for your YGG design -- there are lots of goodies you can work with in Nick jr's YGG papercraft section. They have a full set of iron-ons you can just print out onto transfer paper if you don't feel up to applique -- just pick one, print it and transfer it to your dress front! If you do want to do an applique, or something else crafty, there are plenty of templates on those printable pages. For full-body images, look for the coloring pages, and for large heads, go for the masks. I used the Muno mask for my applique! I cut the pieces out of cotton knit (old t-shirts, actually) -- since knits don't unravel, you don't have to finish the edges of the applique. I assembled the whole thing first using some fusible interfacing (you could also use something like Steam-A-Seam , which I've used on other appliques). If you look close you can see that I overlapped everything -- for example, the teeth are under the upper part of the mouth, and over the bottom part. This made it a lot easier, since I wasn't matching edges up. There's only one bad thing about this Muno dress....it's too small! But I think a Foofa dress may be in the offing (and I don't mean her costume). We'll see. 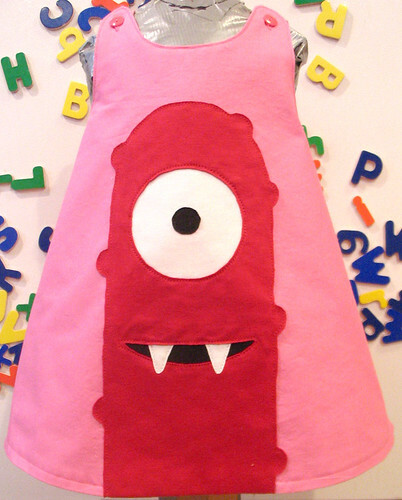 Who will be on your Yo Gabba Gabba dress? Ok....so cute...and my 13 year old wants one!!!!! !